You are currently browsing the VanHulsen blog archives for June, 2009. Sorry about the quality. It’s the only document of this cabinet I have. Made out of walnut, finished with Tung oil.The glass panes have bevelled edges. The cabinet ended up hanging on a wall. The mirror is removable for hanging. "citizen slater aiko", originally uploaded by Aiko and Thomas. The slate project is in full swing. Battered by tunderstorms it’s not going too fast but we are making progress with the job as well as learning. It’s something I always wanted to do once in my life and here it is!. I consider this trade as a form of art. 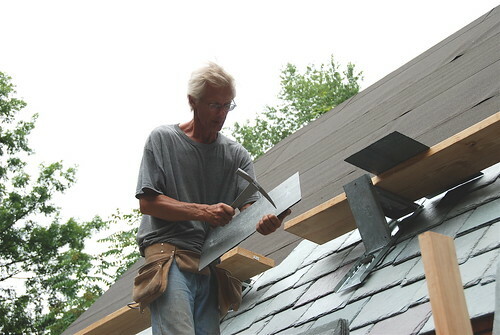 Working with a natural product like slate takes negotiating, patience and concentration. The mechanics of roofing are relatively simple: water always goes down (Isaac Newton can attest to that :)) so you have to abide by certain rules to make the house water proof. But for the rest it’s your feel of balance where to place the different colours. It’s also hard work. That stuff weighs a lot and I carry it up by myself. The weight is approximately a 1000 pounds per square. (one square equals 100 square foot) This roof is about 11 squares. photo courtesy of Nancy, alias customer #4 who came to visit the worksite. The hammer I use is a multifunctional tool: hammer in the copper nails, punch holes in the slate and slice off (resize the slate) when needed. DSC_2062, originally uploaded by Aiko and Thomas. On june 2, the Office of the Indiana State Chemist came to visit. Take samples and photos of the damage of the “suspected” drift. Scepter, Roundup (powermax) and “agrisolutions 2,4-DL V4. No word when they’ll come with a result. It might be october or even december of this year.